Winter’s Bane Is Metal’s Gain As Tim Owens And The Drover Brothers Bring A Night Of Metal - And Fog - To The Brass Monkey, Ottawa, Canada, April 13, 2018 Friday the 13th started just like every other wet and cold work day for both myself and my three team leads Sumayeh, Kelly and Shauna: Show up with four peppermint teas following a detour to Starbucks, turn to the tasks of the day and occasionally make some sort of small talk about anything and everything. And on that one day, that was when the intervention began. Though it was really more like a shared general opinion amongst the group that I start spending money on myself rather than slinging my hard-earned cheese on the mean green respiratory-aiding liquid fuel of the Andes on almost a daily basis on the three team leads who occasionally sign my paycheques. That same drink helped me own a good 20k of walking when I traversed the Rainbow Mountains of Peru last summer - the highest elevation I’ve ever been at, even beating out my brother in law who’d hiked the Himalayas. It must’ve helped team lead Sumayeh during our department’s Easter egg hunt last month when she charged up four flights of stairs in high heels that one time for the next clue for our team, running on pretty much a full head of steam and whatever they put in that tea at Starbucks. I hadn’t seen anyone run that fast in stylish arched footwear with strong determination since Starchild broke up a moshpit during KISS’ set at Bluesfest in 2009. Long story short is that once I’d mentioned my preference of maybe catching this display of true metal awesomeness at the Brass Monkey, I was told to immediately spend my money on this event. In other words, this show and review was endorsed by all three team leads Sumayeh, Kelly and Shauna. Because they were becoming overwhelmed by too many peppermint tea visits. Or they wanted a mention in this review. The former sounds more plausible to be honest so I’m rollin’ with that. At the show and pretty much essentially expecting a night of awesomely performed metal classics, local hard rock metal quartet VINDICATED kick off the festivities of the evening even if the setlist is comprised mostly of METALLICA and ACCEPT covers. Frontman Liam Fullerton definitely has a command of the vocal histrionics of James Hetfield and Mark Tornillo as he conquers the vocal prowess of “For Whom The Bell Tolls” and even “Teutonic Terror” among other renditions. Credit to a frontman who acknowledges the latter day work of one of the finer German exports of the past who weren’t the SCORPIONS or HELLOWEEN for your set slayed hundredfold otherwise. The headliners for A NIGHT OF METAL are not just critically renowned for their all-star lineup but for their delivery of the catalogue of the classics. 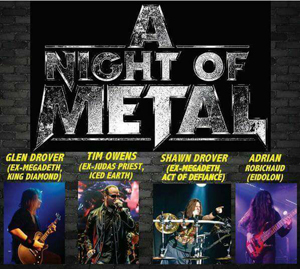 When your lineup boasts of the Drover brothers (Glen on guitar, Shawn on drums), bass player Adrian Robichaud and frontman Tim “Ripper” Owens, you know you’ll be guaranteed exactly what the name on the poster announces. And the band start off in full force with a soaring rendition of “The Hellion/Electric Eye”, a popular number which the Ripper is well familiar with during his time fronting JUDAS PRIEST, emoting Rob Halford’s sonic vocals while adding his own signature grit-laden sounds to the headbanging classic which some of us had only just heard played by the originators barely three weeks prior. But while Ripper could practically perform the entire 80’s PRIEST catalogue in his sleep, his renditions of other metal greats are also golden. Crushing renditions of “Creeping Death” and “Walk” also follow, and to the benefit of the Drover brothers who had played on at least two MEGADETH albums in the mid-2000’s, the supergroup also deliver a ferocious version of “Symphony Of Destruction”, with Glen Drover exhibiting much of the dual solo delivery of Dave Mustaine and Marty Friedman in the song. Even the legacy of the late great Ronnie James Dio is honored through Ripper’s solid delivery of “Heaven And Hell” and “Children Of The Sea” as the crowd are commanded to throw down the horns in Ronnie’s honor. And that was probably when the fog machine seemed to go on full blast. There’s no question that the performance of all four established musicians was legendary, but the sudden influx of fog was beginning to leave me just as breathless as my chanting of song requests were. Ripper was already taking off his massive leather jacket by the halfway mark because it was beginning to exceed normal room temperature thanks to the massive condensation taking place on the stage because of the sweltering fog. Pretty sure my voice gave out right after chanting the words to either “I Don’t Know” or “22 Acacia Avenue”, leaving me bewildered and ashamed that I was lacking the vocal capacity of such legends as Ozzy and Bruce Dickinson - both at least 30 years my senior - as I had to sheepishly (and somewhat drunkenly) exit stage left and rehydrate with a few glasses of ice water. I was also reminded that pretty much every metal singer ranging from Halford to the Ripper often healed their voices with warm tea....preferably peppermint as it’s herbal and naturally cleanses the throat. Sumayeh, Kelly and Shauna will probably be touring with TRANS-SIBERIAN ORCHESTRA in two years’ time at this rate. But glad that it took this show for me to never turn my back on the peppermint green manalishi and the three team leads whom I was buying it for. Meanwhile, catch this show as you’ll be in for a surprise and a shock at how ripping A NIGHT OF METAL can be.